There was a large turnout of 32 people at the third Learning Community Workshop! We would like to acknowledge the presence and active contribution of you all: Ntataise, TREE, Sikhula Sonke, Masibumbane, The Learning Initiative, LETCEE, Smartstart, True North, Cotlands, Tshepang, ELRU, Knysna Education Trust, Ubunye Foundation, Lesedi, The Unlimited Child, Babathane Trust, Innovation Edge and Ilifa Labantwana. The growth in the ELOM Learning Community speaks to the value offered by an opportunity to learn together and the space for collaboration and sharing lessons from the coalface. Linda Biersteker welcomed all participants by providing an update on ELOM training, website developments, resource access, international feedback, recent studies and new directions. Sikhula Sonke, Masibumbane, and Khululeka (in absentia) then presented their experiences in formative programme evaluations using the ELOM. They spoke on about how they are integrating good and poor ELOM results in key domains into their organisational strategies, and what specifically they are doing to improve the quality of ECD services in very impoverished and compromised communities. Megan Blair from Blue Door then led a fascinating afternoon discussion on thinking about ways to support teachers to create positive learning outcomes, and what it takes to get good outcomes from mentoring. Much debate was sparked regarding workable, realistic and impactful coach/mentee ratios which fed into the next day’s session led by Linda Biersteker and Andy Dawes on elements and evidence of scaling up with quality. 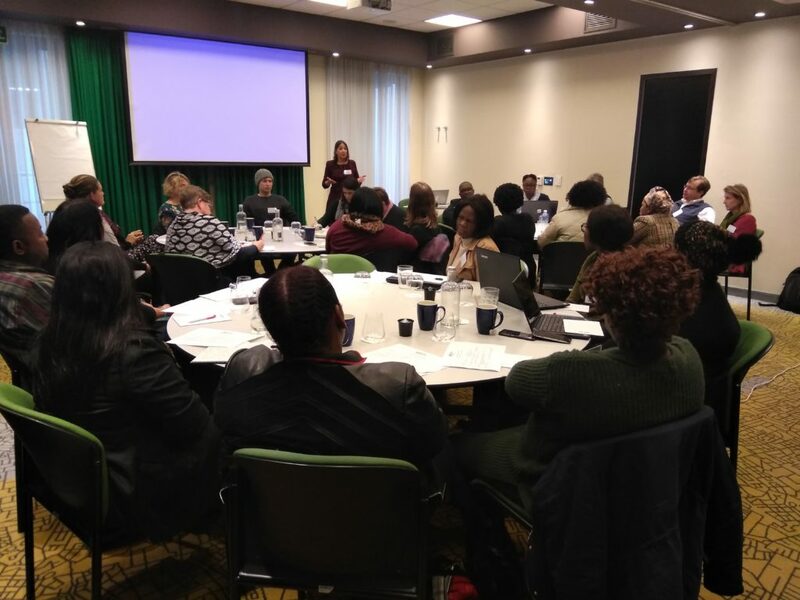 Three large organisations (Cotlands, Smartstart, The Unlimited Child) shared how they are approaching scale up, and their successes and challenges in different programme settings. In addition to this, the Learning Initiative spoke on targeted interventions and using the ELOM as a screening for children at risk. Elizabeth Girdwood highlighted the practical learnings emerging from ELOM assessments during recent large research studies: the importance of targeted age ranges, ensuring WHO screening & referrals work together, what to do when ethical concerns are voiced, ensuring accurate quintile allocation, measuring children’s Height for Age, interpreting ELOM reports, and caregiver interviews to assess the Home Learning Environment. Matthew Snelling spoke on the recently completed Teacher Assessment Psychometrics and the integration of this into the tablet for those organisations wishing to use it to measure social emotional functioning. Finally, there was discussion on how the ELOM should manage the continuous professional development (CPD), support of active and non-active assessors, and re-training of its assessor cadre which is currently around 100 people strong around the country. Sonja Giese led the closing session in which participants shared reflection on what they had found enlightening and challenging in using the ELOM. Key trials included sampling issues due to children’s age and the number of assessments needed for adequate analysis, the costs or resource constraints of deploying assessors frequently when they are working elsewhere, the resistance from practitioners to having their children assessed, and understanding their ELOM reports. On the other side, organisations derived enormous value from having the ELOM validate their programmes, identify what needs fixing and belonging to a community which is learning and collaborating together to address common challenges. ELOM publication in an international journal!